The Many Mini-Adventures of the Wards: Are they ready? Yes, they are! 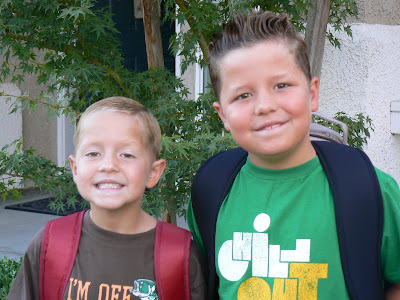 Trevor and Logan began the 2007-2008 school year today! They were up at 6AM and ready to go by 6:30. We didn't need to leave until 7:50 so there was plenty of time to kill. They checked and rechecked everything several times just to make sure they wouldn't forget anything. new lunch bag and waterbottle? check. kiss mom? uh....not in front of my friends, please! Logan is excited for his lunch in the cafeteria. And Trevor cannot wait to play soccer again this year. These guys are ready for anything! Off we go! How cute that they were so excited! I wish I was that eager to start school school again!